Tola the Turtle, the new mascot of the National Bank of the Virgin Islands (NBVI) was launched during the institution’s 2015 customer appreciation day event held on 15 December. 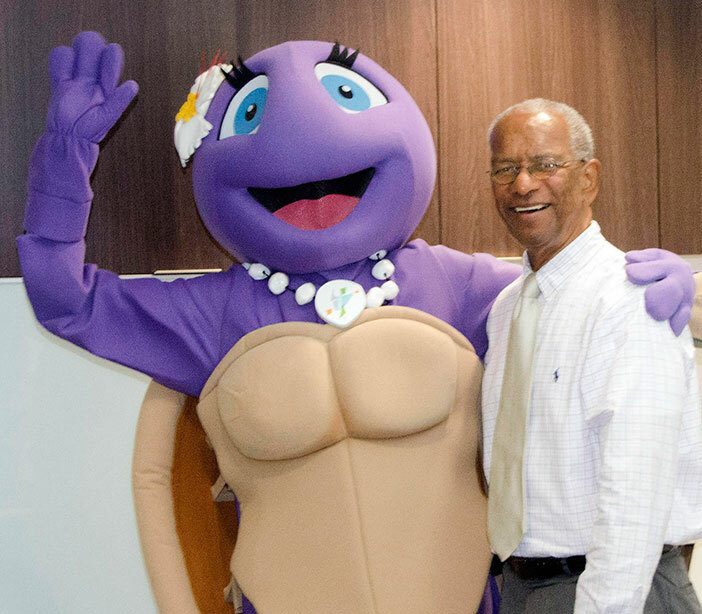 CEO of NBVI, Joy Francis said that the day was an exciting one for the organization, and stated that the launch of Tola the Turtle was a mini preview to some of the plans for next year. The CEO stated that the Bank intends to unveil a suite of saving plans and noted that there will be plans tailored to youth. She commented that the Bank operates with the motto — ‘the bank of paradise’ — and said that many of those attributes were incorporated into Tola the Turtle. Ms. Francis pointed out that Tola wears a pearl necklace that showcases the bank’s logo, has a pet turtle dove, and most importantly the familiar purple/lilac bank color. Students from Motions Studio of the Arts were elated to spend time with the new mascot and many welcomed an opportunity to take selfies, and sing Christmas songs with Tola by their side. The group of children and Tola also posed for photos with members of the Bank’s Board. The day featured live music from the Razor Blades, and food, drinks and goodie bags were enjoyed by attendees.